The G series smartphones from LG usually launch at the CES or the MWC but this year, the launch of LG G7 was postponed for some reasons, and in case you aren’t aware, the phone is launching officially on May 3 as LG G7 ThinQ. We saw the ‘ThinQ’ branded LG V30 launching this year, and it is for some AI related features that are present on the phone. Last year, the LG G6 was launched at the beginning of 2017, but the phone came with 2016’s processor, and so, it didn’t sell so well. This year, LG isn’t repeating such a mistake, and the G7 ThinQ is coming with the Snapdragon 845 processor. 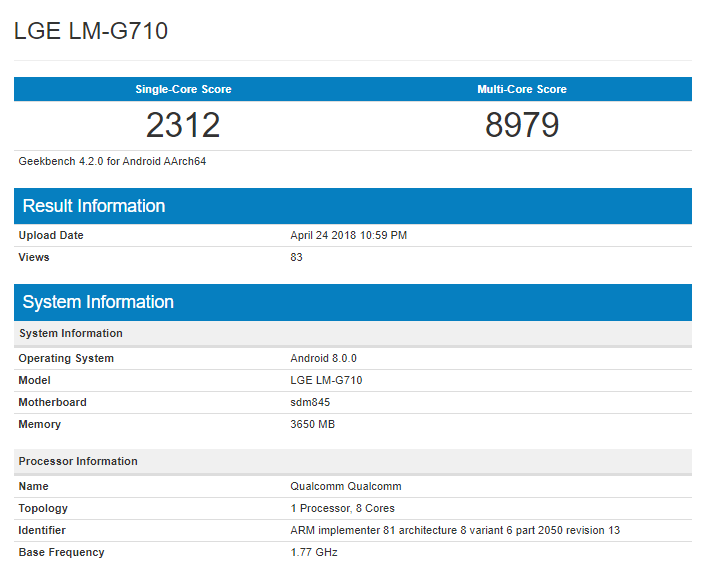 Today, the LG G7 ThinQ was benchmarked on Geekbench that revealed the single core and multi-core scores. As expected, they are similar to the scores of other Snapdragon 845-powered devices like Galaxy S9, Xiaomi Mi Mix 2S, etc. Listed with the model number LGE LM-G710, the phone has 4GB RAM and runs Android 8.0.0 Oreo out of the box. The phone scored 2,312 on the single-core and 8,979 on Multi-core, which is quite similar to other phone powered by the same chipset. As mentioned in the beginning, the launch is set to happen on May 3.